Elena loves cooking. 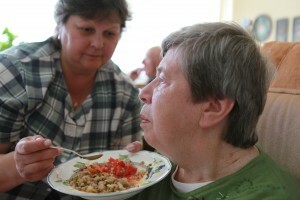 She feeds the old lady East European delicacies. Elena has been hired by the lady’s daughter to take care of her. Elena and her good friend Maria work in shifts. 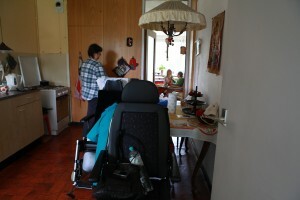 The old lady can hardly move and Elena and Maria lift her from her bed into a chair, from the chair onto a plastic chair to take a shower, into a wheelchair to take a walk. 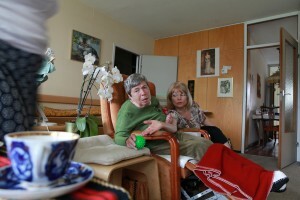 They both live in a small apartment in a small village on the outskirts of Amsterdam. 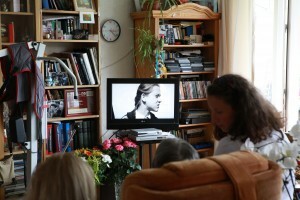 The house is quiet but for the TV set which shows Russian movies from the old lady’s collection. 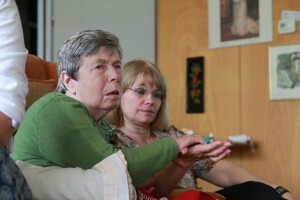 Sometimes they sing or cry together, watching.Elena was born in what used to be the USSR, the old lady was born there too. They speak Russian to her. The old lady tries to speak, but the sounds she makes are not discernible as words, let alone sentences. It’s not clear what she understands. Her ex-husband, who visits every day, is worried. ‘You shouldn’t let her watch detective series on the telly. We can’t tell if she wants to watch those. All that blood,’ he says. Elena and Maria are friendly, caring people. When I ask Elena to speak about her job, the joys and the sorrows, she says it’s a heavy job. ‘But I don’t think it’s kind if we speak about the lady in her presence. Let’s go outside and smoke a cigarette on the balcony.’We smoke and Elena continues: ‘This work is hard, you need physical strength to lift up a person who cannot move by herself. And it’s emotionally hard because I see how her body and mind deteriorate. She wants to speak but can’t. She wants to eat, but has difficulty swallowing the food by herself. She chokes more and more often.’ She sighs. Elena’s day starts at 7 am, making breakfast and it ends at 9 pm when the old lady goes to sleep, at 2 am she checks if the old lady is comfortably sleeping. She has breaks, takes turns with Maria and her employers offer her free time, but she doesn’t feel the need or trust herself to take a bus to go on a trip to Amsterdam. She is here to make money, not to spend it. Is this the job she always dreamed of? No, but she takes life as it comes. She once owned two bars, worked as a saleswoman. ‘But we face crisis after crisis in our economy.’ If there would have been a job closer to her home that would be paid as well she would have taken that. She dislikes being a 24 hour bus ride away from home. Yet she doesn’t want to depend on her 28 year old son and his pregnant wife. She will be taking a four months leave, because her first grandchild will be born just before Christmas. Elena will spend some time with the three of them and return in spring. Dit bericht werd geplaatst in Geen categorie door Nies Medema . Bookmark de permalink .